An avian predator of the Islands, the Galapagos short-eared owl has developed unique behaviours to aid hunting. The Galapagos short-eared owl is a sub-species of the short-eared owl, a bird which found on all continents except Antarctica. Galapagos short-eared owls are endemic to the Galapagos Islands and, as is frequently the case with Galapagos endemics, their coloration is darker and they are smaller than their mainland counterparts. Their name arises from the small ear tufts set near the centre of their forehead. They have a wingspan of 85-100cm and are silent fliers. The sexes are alike, with the females generally larger than the males, and immature plumage resembling that of the adults. They are found in open areas of grassland or lava rock, and hunt by flying low over these areas, feeding on rats, lava lizards, and birds. 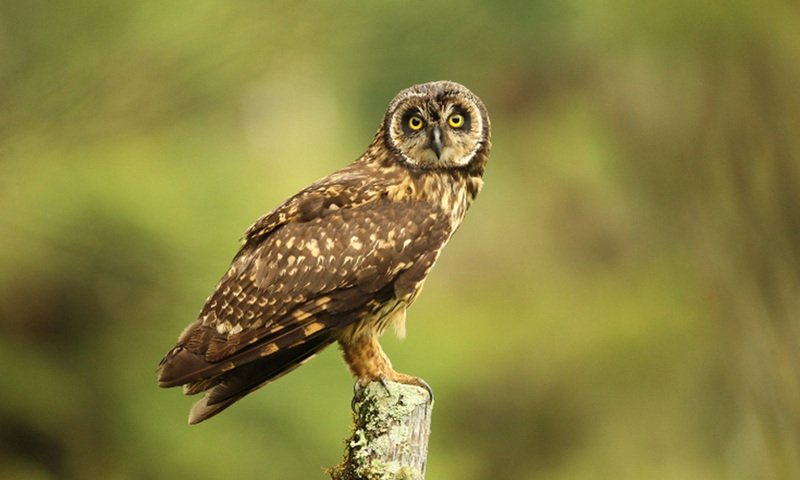 Most owls hunt at night, however the Galapagos short-eared owl has adapted to hunt in the daytime as well, to avoid competition with the Galapagos hawk. They are able to hunt birds much larger than themselves, such as boobies, by striking at the back of the neck, taking the bird by surprise. 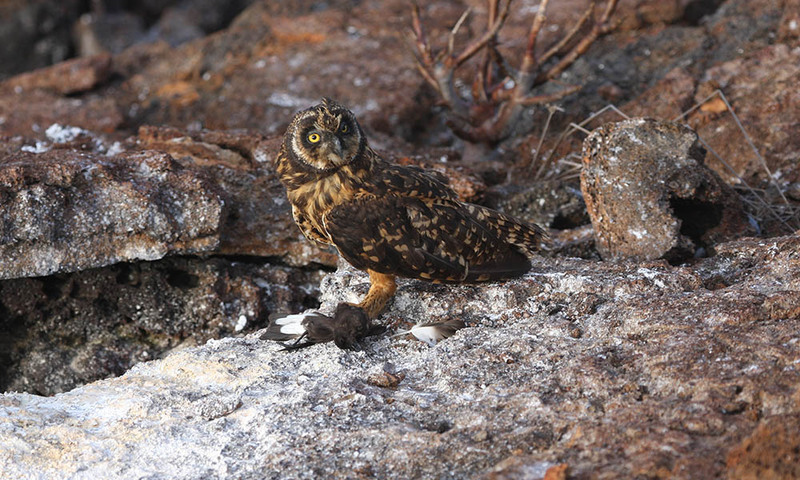 The Galapagos short-eared owl has developed a unique hunting behaviour on Genovesa island, at a colony of storm petrels. The petrels nest deep in tunnels in the lava rock, usually out of reach of the owls. However the owls have learnt to stalk nearby, watching the petrels as they enter and leave the tunnels. The owls then wait close by for the petrel to leave the tunnel and catch them unawares. Another technique they use is to hide in the entrance of the tunnel to grab a petrel as it flies in. They tend to nest under trees and shrubs, and have one clutch per year of two to four eggs. The eggs hatch in three to six weeks, and the young are ready to fledge at four weeks old. The juvenile birds are ready to mate and reproduce after one year old. Their population was estimated to be around 9,000 pairs in the 1980s, but further research is needed to calculate their current population status. Where to see them: The Galapagos short-eared owl is wide-spread throughout the Archipelago, and have been known to fly between islands. They are most frequently seen hunting in the seabird colonies of Genovesa. When to see them: They can be seen at any time of year. They are most active at night and early in the morning on most islands, and they can be seen in the day time on islands where the Galapagos hawk is absent. 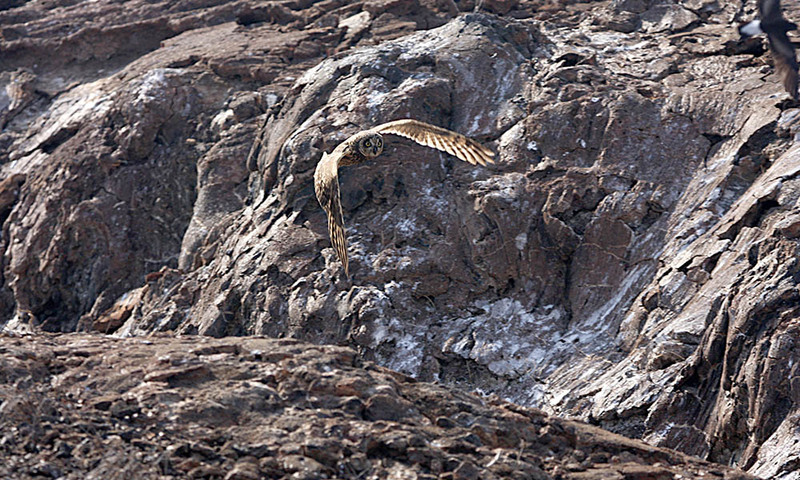 Threats: The biggest threat to the Galapagos short-eared owl is the predation of their eggs by introduced rats. Conservation action: There are currently no projects specifically focused on the conservation of the Galapagos short-eared owl. However they will benefit from our programme to restore the habitat on Floreana by eradicating invasive mammals.